Search BOB to access an archive of over one million TV and radio recordings, or to make recording requests of your own. For more information about BOB and how it can support your work, visit our LibGuides. 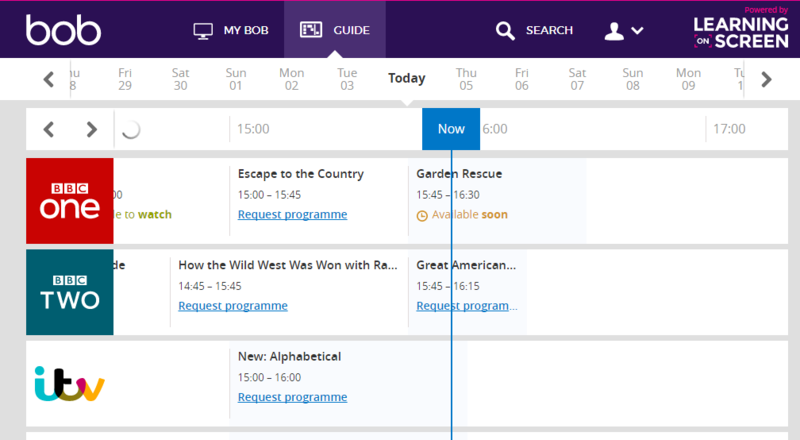 BOB allows staff and students to record programmes which will be broadcast over the next seven days, as well as retrieving programmes from the last 30 days of recorded channels. You can also click here to access the BOB help pages, or visit the online video tutorials for information on how to get the most out of this extensive resource. BOB can be accessed via the A-Z Databases site. This entry was posted in Uncategorized on 4th Oct, 2017 by Craig William McEwan. 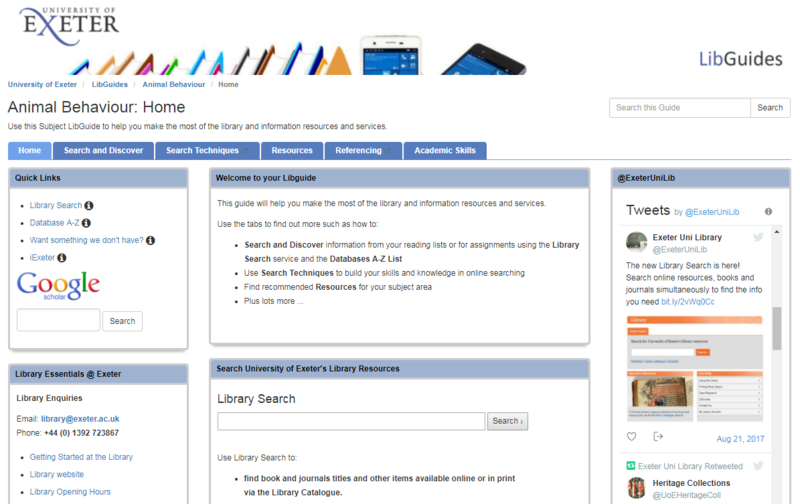 Welcome to LibGuides, our new online platform for Library support. LibGuides are a versatile and easy-to-use tool that will help you make the most of your Library resources and facilities, and provide extensive support in a number of key areas. The new A-Z Databases page provides you with easy access to the University’s extensive online collection. Browse a full A-Z list of our online databases and archives, including trial subscriptions. 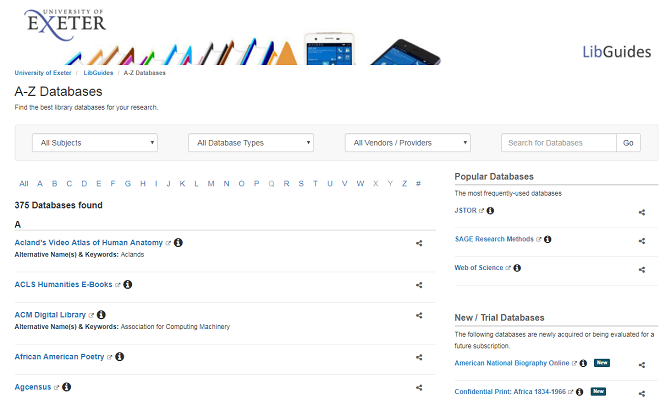 You can also search for individual databases, or filter databases by subject area or content type (journals, ebooks, archives etc.). 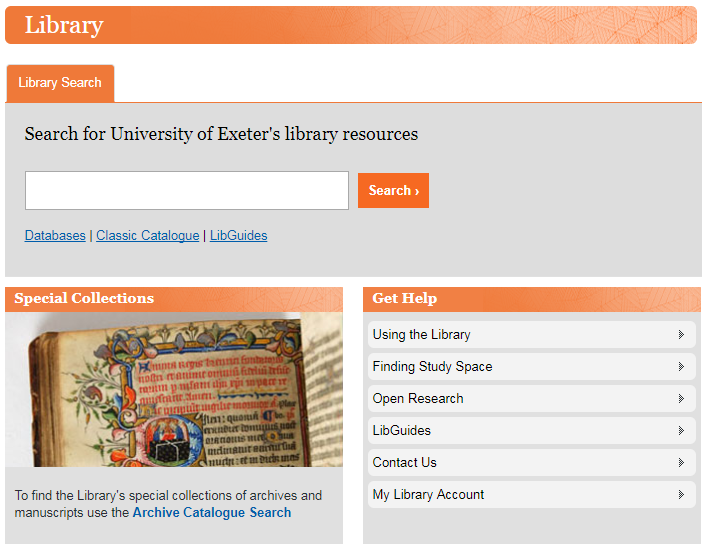 You can access the A-Z Databases page via the Library webpage, or go to the page directly via this link – http://libguides.exeter.ac.uk/az.php. 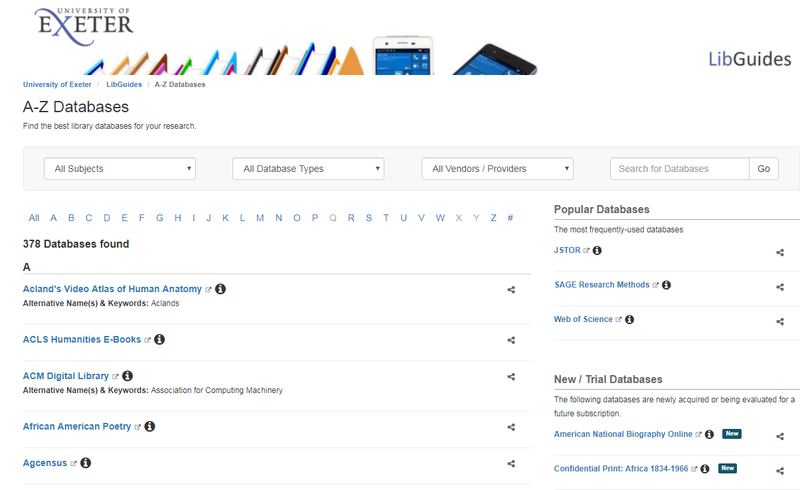 The new A-Z Databases page puts a wealth of online resources at your fingertips. Subject Guides are a focal point of Library information and support for individual subject areas, bringing together essential resources, guidance and Library information in one convenient location. Each guide provides a comprehensive introduction to Library services, introduces you to Library Search and highlights a range of key resources for research in your subject discipline. There are also tips on developing your literature searching skills and guidance on a range of referencing styles. Subject Guides bring together essential Library resources and guidance for each subject area in one convenient location. Subject Guides for every University subject area will be fully complete and accessible by the start of term. You can access our selection of Subject Guides here – http://libguides.exeter.ac.uk/. Our collection of General Purpose and Topic Guides provide support for a number of additional subjects. Getting Started: An introduction to Exeter’s core Library services and facilities. Copyright for students: Copyright can be a complex issue. This clear, plain-English guide covers all of the essential copyright information that you need to know. Primary Sources: A quick guide on how to find and make the most of primary sources in a range of subjects. Making the most of Google Scholar: Tips on successfully harnessing Google’s free academic search tool. Getting yourself known: Advice and guidance for academics looking to enhance their research profile. To view our full range of General Purpose and Topic Guides, go to the LibGuides homepage and select ‘By Type’. This entry was posted in Uncategorized on 5th Sep, 2017 by Craig William McEwan. Your new Library Search is here! With a new academic year approaching, the Library has launched its new and improved Library Search tool. Library Search offers improved discovery and access to the University’s wealth of online and print resources. Both Library Search and the Special Collections and Archives Catalogue are at the heart of your new-look Library webpage. The default ‘Articles + more’ option acts as an all-in-one gateway to your rich collection of online and print resources (including Open Research Exeter), allowing you to search and identify the material you need down to individual article level. Switch to the ‘Catalogue’ option to focus your search to particular book and journal titles held by the Library. Use ‘Articles + more’ to search our extensive range of resources down to article level. Along with a cleaner look and feel, additional functionality has been added to streamline your searching experience. You can now use a range of new filters on the left of the results page to refine your search. Filter by publication date, source type, journal title and more, to give yourself the best chance of finding the resources you need. Through Library Search, you can also access online articles, export citations to EndNote and create a folder of saved items directly from your search results page. The old ‘Electronic Library A-Z’ has also been replaced by an improved ‘A-Z Databases’ hub in our new LibGuides platform. As well as locating databases alphabetically, you can filter the collection by subject area or resource type and gain access to our new Subject Guides, which offer in-depth, tailored Library support for individual subject disciplines. Your A-Z database list can now be accessed through our new LibGuides platform. In addition to the host of new options, Library Search has retained a number of core elements from the previous catalogue. You can use Library Search to access your Library account and still have access to a detailed ‘Advanced Search’ function. We have also retained a link to the ‘Classic Catalogue’, for those who retain a fondness for the old interface. You can also click here to access Library Search and bookmark your direct link. We have also produced a Library Search mini-guide, which includes a series of tips and instructional videos that will help you make the most of your Library Search. 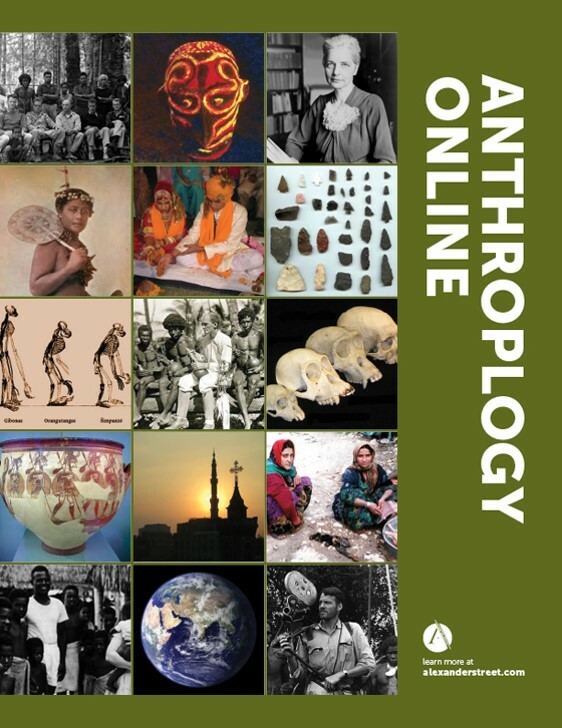 This entry was posted in Uncategorized and tagged articles, books, catalogue, databases, journals, LibGuides, Library, Library Search, online catalogue, online resources, serach on 18th Aug, 2017 by Craig William McEwan. 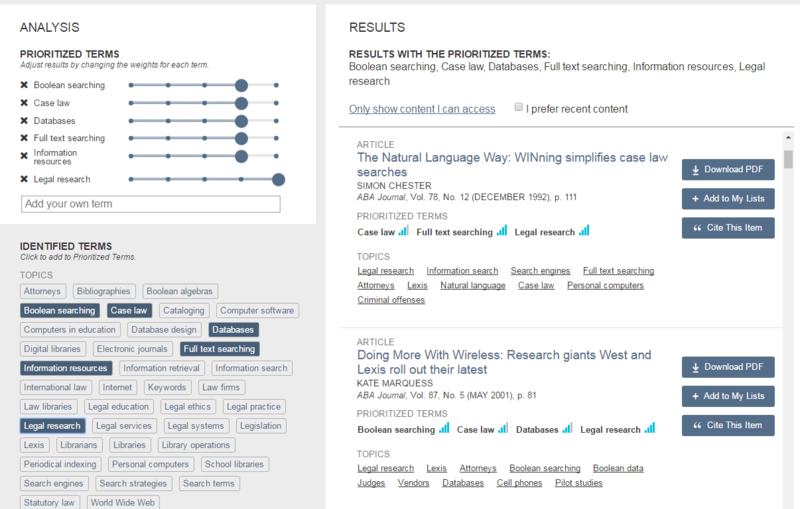 Regular users of JSTOR will have noticed that the search interface has an updated look and feel. A new visual design has been introduced along with an enhanced searching and browsing experience. All the existing content and functionality remains. This entry was posted in E-Resources on 2nd Aug, 2017 by Lee Snook. The University now has access to the London Low Life. This full-text searchable resource, contains colour digital images of rare books, ephemera, maps and other materials relating to 18th, 19th and early 20th century London. 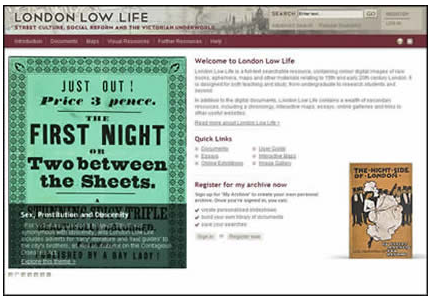 London Low Life brings to life the teeming streets of Victorian London, inviting students and scholars to explore the gin palaces, brothels and East End slums of the nineteenth century’s greatest city. From salacious ‘swell’s guides’ to scandalous broadsides and subversive posters, the material sold and exchanged on London’s bustling thoroughfares offers an unparalleled insight into the dark underworld of the city. Children’s chapbooks, street cries, slang dictionaries and ballads were all part of a vibrant culture of street literature. This is also an incredible visual resource for students and scholars of London, with many full colour maps, cartoons, sketches and a full set of the essential Tallis’ Street Views of London – a unique resource for the study of London architecture and commerce. This entry was posted in E-Resources, Uncategorized on 27th Jun, 2017 by Lee Snook. ESDU is an engineering knowledge base which provides validated design methods, data and software tools to help solve complex engineering problems. It covers a wide range of engineering disciplines, including Aerospace, Automotive, Mechanical, Structural and Process Engineering. Note that you will need to accept the Academic Terms & Conditions each time you log in to the EDSU service. Online guidance is available to help you get started. This entry was posted in E-Resources, Research on 10th May, 2017 by Lee Snook. 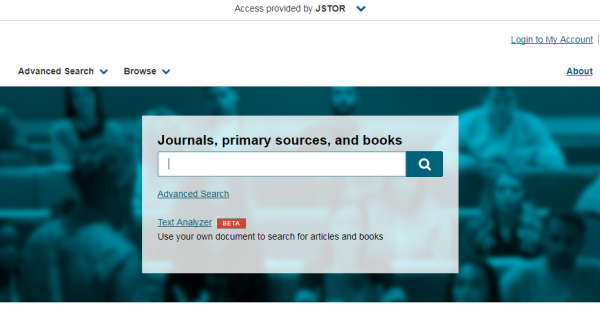 JSTOR Labs have introduced a beta research search tool that is worth exploring. You can upload or drag and drop a file into the search box and the Analyzer tool will analyze the keywords and then produce a list of JSTOR items that match those keywords. You can even use your phone to photograph some text and upload that for analysis!. This service is not perfect but you can improve its use as a bibliographic research tool by adding additional keywords, and ranking their importance. You need a fairly significant piece of text to benefit from this tool, but you can drop in all sorts of files such as an assignment, work based report or journal article you are working on. You will get mismatches and it will work better with some searches than other, but if you are struggling to retrieve content from your usual search strategies, why not see if this helps. 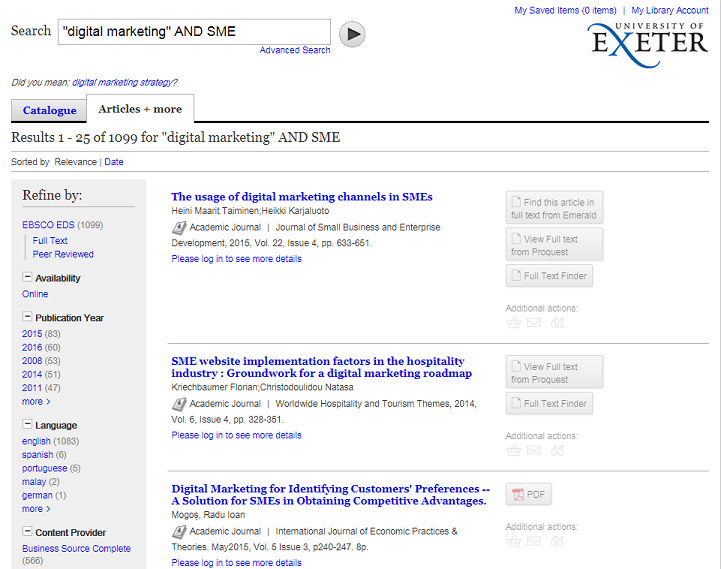 The University of Exeter has extensive subscriptions to the journal and book content on JSTOR, so not only will you get a list of results, you’ll be able to examine the full text of your matching documents in the majority of cases. Thinking only of keyword search within an academic context: junior researchers sometimes flail and thrash as they figure out the right keywords for their search – they know what they want, but what set of jargon-y terms will help them find it? At the other end of the spectrum, more experienced researchers can find themselves caught in discipline- or citation-based siloes, unaware of what they are unaware of (until the peer review feedback comes in…). I think JSTOR Labs might have something to help with these problems. I gave it a trial by uploading a recent Powerpoint file we used with law undergraduates during a session on planning and conducting legal research for dissertations and it did a pretty good job of extracting key concepts from the document and finding related content. I added some phrases to the prioritized terms and played with the weightings until I got the most useful sets of search results for my needs. So, if you are going to explore, I recommend you use the tools to add and adjust the importance of your search terms. This entry was posted in Information skills, Research on 5th May, 2017 by Lee Snook. Next Saturday, 29th April, at 2pm there will be a special screening of Bill Douglas’s masterpiece ‘Comrades’ at Exeter Phoenix. The screening will be introduced by Bill’s lifelong friend and collaborator Peter Jewell and marks the 20th anniversary of the opening of The Bill Douglas Cinema Museum, the accession by the University of Bill Douglas’s working papers and the 30th anniversary of the original release of the film. 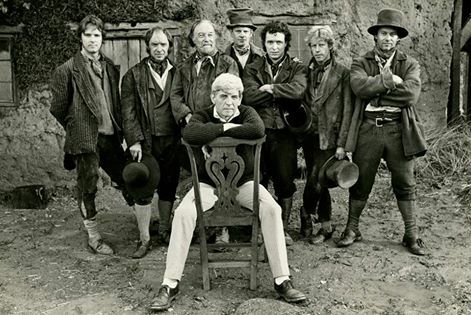 The film; a poor man’s epic’ tells the story of the Tolpuddle Marytrs and features early performances by well-known actors such as Imelda Staunton and Keith Allen. Here’s a photo of Bill with the cast, taken on set by David Appleby. This entry was posted in Bill Douglas Cinema Museum, Drama on 26th Apr, 2017 by Susan Abbott. The University now has access to Aerial Digimap a new collection from the Digimap suite of GIS services. The aerial imagery data in the service is 25cm resolution vertical aerial imagery supplied by Getmapping PLC, and is the most detailed aerial imagery available for the whole of Great Britain. 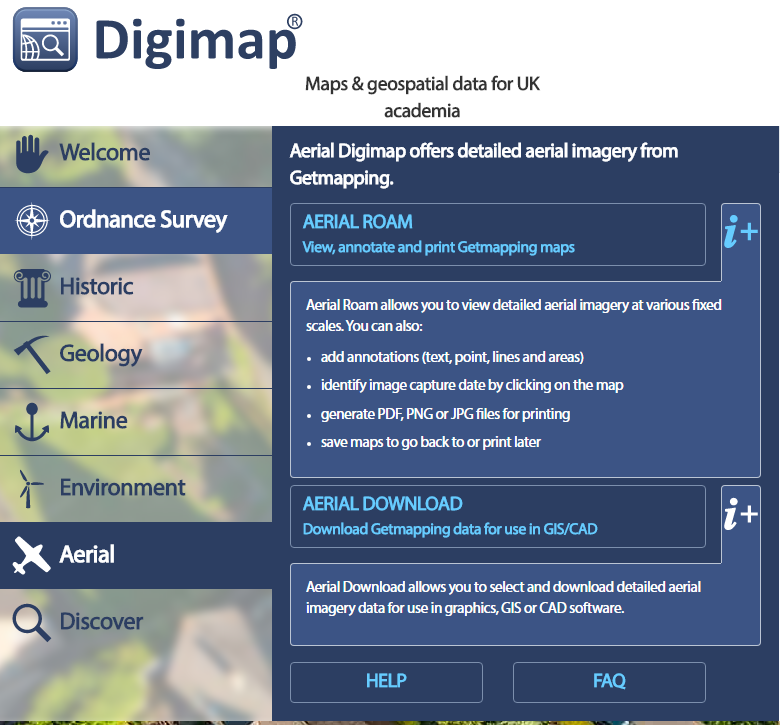 You can access all the Digimap services available to you via the University of Exeter subscriptions through the Maps section of the Electronic library. You will need to register before using the Digimap services, by completing a short online registration form. Aerial Roam offers the ability to view, annotate and print the aerial photographs as well as an overlay function to allow comparison with current Ordnance Survey mapping. For an introduction to this service, take a look at the preview demonstration on Digimap’s YouTube channel: https://youtu.be/rAiO4XXRD5Q. Online help is also available. This entry was posted in E-Resources on 20th Apr, 2017 by Lee Snook. Are you a Social Sciences Student Looking for Resources ? Then click through our short presentation Social Science s to see what we have on offer to help you. This entry was posted in Uncategorized on 6th Feb, 2017 by Susan Abbott.